I wrote an introduction to developing your website a couple of issues back and although I wasn’t going to cover the copyright/image size debate again so quickly, a blog post from a fellow photographer (Chris France) made me think more about my reasons for publishing images at such a large size. (for those of you who haven’t seen, I have quite a few photographs on flickr posted at the maximum size Flickr allows - quite often 50 megapixels worth). Chris wanted to raise the issue of Internet image fraud by finding some large online photographs and making prints of them. This was supposed to demonstrate how easy it is for people to pinch your photographs and potentially sell them for financial gain. He chose a 1200px image from Ian Cameron which was printed up to postcard size and also a photograph of Seil near Oban that I had uploaded at about 7000px longest edge. Firstly the Ian Cameron image. This was printed at 6” and the logic following on from the article considers the danger from someone downloading many of these images and then offering them for sale either at art fairs or online. Let’s consider that danger for a moment. It supposes a non-photographer in his spare time (or potentially full time) will make a living from selling postcards printed at £1.50. Well I’d love to know the photographer that is managing this because most of them I know can’t. The only people I know making money from postcards need to have contacts for bulk printing to bring per-unit costs down massively and even then they have to spend a lot of time getting those pictures into a huge numbers of shops. Only then can a reasonable income be made. And we suppose that someone is going to make this effort at the risk of being prosecuted for multiple cases of infringing copyright - and they are fairly certain to be found out if they get enough distribution to make any money. The question is, does this impact the income of the photographer? I find it difficult to imagine it would unless they were trying to sell postcards from the same location, which would lead to a quick discovery and potentially a financial settlement to the photographers benefit. Moving on to my own pictures, the main photograph was blown up to 16” x 20” and printed for a total cost of £40. The suggestion here is that the photographer could easily sell this for more than a hundred pounds and make a tidy profit. Well I know a lot of photographers again and I don’t know many that can make a significant sum from print sales without reducing the print costs down below that mentioned and without spending a lot of time promoting their business, building up a reputation and working hard at art fairs, etc. Yes the photographer could possibly sell a handful and even make a few hundred quid. 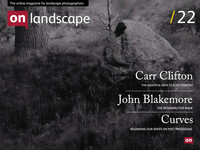 However, the chances of someone finding out in a relatively small scene such as landscape photography in the UK is? Quite high I would say. Would the original photographer lose money through this process. Well I could imagine a handful of people may have the inclination to find a picture they really want from my website and print out their own version to hang on the wall, but if they could afford the £40 to print it, I imagine most would try and raise a little extra to get it from the photographer (and those that wouldn’t - well they wouldn’t have bought the image in the first place). Now we get to my response as to why I upload images so large (it’s a shame the original website doesn’t allow comments, it could have made for an interesting discussion). I come from an engineering background and have travelled in my career through the music industry and have also ran and sold a software consultancy that specialised in open source. The music industry is probably a great metaphor for the topic at hand. Music companies have been in sheer terror at the thought of losing their business if they allowed consumers to pass on the actual copies of the music they were selling. Downloads were going to kill the industry and god forbid the company that sold music without Digital Rights Management (DRM) or let it become available on the internet at the highest quality. Well, I think most people know what happened here. It is now easier to illegally download a 192kHz FLAC file (higher quality than most CDs and definitely a lot higher quality than mp3 music downloads) than it is to buy one. So why do people buy the obviously inferior version? This question has many answers but the obvious one is that most people are basically honest and if they see a value to something they want to pay something in exchange. The music industry found it incredible that people would download a version of a song or album, listen to it and then buy the official version? Huh!!? In addition to this, the record labels that released their songs without DRM made more money?! Double Huh?! Yes there are unscrupulous people that will try to create a complete copy of a CD at a huge discount and sell them down pubs but this is going to happen regardless, you can’t stop human nature. The financial impact of these activities? Less than the financial advantage of a user-friendly approach. The case of open source software is another influence on my approach. The idea behind open source software is that people give away their hard work for the benefit of the community and for personal ‘kudos’. Linux and FreeBSD (the operating system behind Mac OSX) were both created and given away, the former under a license that forced sharing, the latter under a license that allowed any use at all. The creators of the main parts of these systems made no direct financial gain from the hard work that went into them. They did however become well known experts in certain fields and most have made a reasonable amount of indirect gain through employment, contract, etc. The bigger gain comes because lots of people have shared. The individual sharing extrapolated to a global basis has been the foundation for one of the greatest innovations of the millennia, the Internet. So, given these influences why do I share my photographs? Well, I use a large format camera because it produces such intenesly detailed work and I want to share that with people. If I only showed the high resolution files to people that bought 30” x 40” prints then instead of thousands of people seeing the work, it would only be a small handful (if any to be perfectly honest). I’m also an advocate for film and medium/large format photography and I show the results of my work to give people the opportunity to see what it is capable of (a resource that is unavailable or very rare anywhere else to my knowledge). This is also the reason I run workshops with Dav Thomas for very little financial gain. The experience of teaching is a learning process in and of itself and if it gets me into the landscape, provides good company and pays for a little bit of film that is fine by me. Should everybody share images at the size I do? Probably not, but the risks are a lot less than would be imagined. The most pervasive form of image theft is for use on other peoples websites and unless you use stupidly small images, people can clone or crop watermarks out of the picture. Yes, having large picture does allow the use as wide website banners but people can just stitch together a few images or use ‘context aware scale’ to expand them. I think Chris' article was very interesting and helped me focus my reasoning beyond simple business decision and gut feeling. Image theft will happen, regardless of what you do. Think carefully about the potential financial impact on your business and ask yourself whether your worries are business related or just an emotional knee jerk reaction that is stopping you showing off your creations to their best. I should also add that the copyright on many fine works of art has expired and images such as Ansel Adams and Dorothea Lange are free to copy and print for money, legally. And yet very few people do this. Why? Because it's hard to make money from Art, even when you are the artist.